A small production label (2,500 cases) owned by winemaker Jeff Hansen, a twenty-five year wine industry veteran who was previously the winemaker and part owner of Amici Cellars in Mendocino County, California. He made his first Pinot Noir in 2002 from grapes grown in the Mendocino Coastal town of Comptche and since then, all of his Pinot Noirs have come from that area. 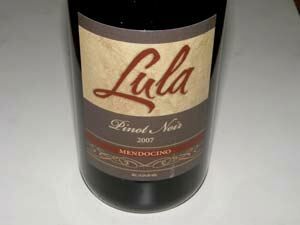 Hansen eventually left Amici, moved to the Mendocino Coast and started Lula Cellars. Lula was the name of Hansen's grandmother, who was born in 1879 in Oklahoma, and lived to the ripe age of 89. In 2012, three Pinot Noirs were offered: Costa Vineyard (Comptche, Mendocino County), Peterson Vineyard (Comptche, Mendocino County) and a Mendocino County blend of grapes from Comptche. Zinfandel, Gewürztraminer, Pinot Gris, Sauvignon Blanc and a Roato are also produced. In October 2014, a new tasting room was opened on a 22-acre property in Anderson Valley. The new property has frontage along Hwy 128 in Philo (at the corner of Hwy 128 and Guntley Road next door to Handley Cellars), and includes a 14-acre Pinot Noir vineyard, a tasting room and a small production winemaking facility. In 2015, an event area is available for weddings and private parties. The tasting room is open daily from 10:00 to 6:00. In May 2017, after more than 30 years of making California wines, Jeff Hansen announced he was stepping down as winemaker, but will retain the title of Founder, and will serve as Winemaker Emeritus and stay on in a consulting capacity for a year. Matt Parish will be the new winemaker. The wines are only sold directly to consumers. 707-895-3737.